Last year, I was excited to buy Levi a new bib that said "My First Thanksgiving." 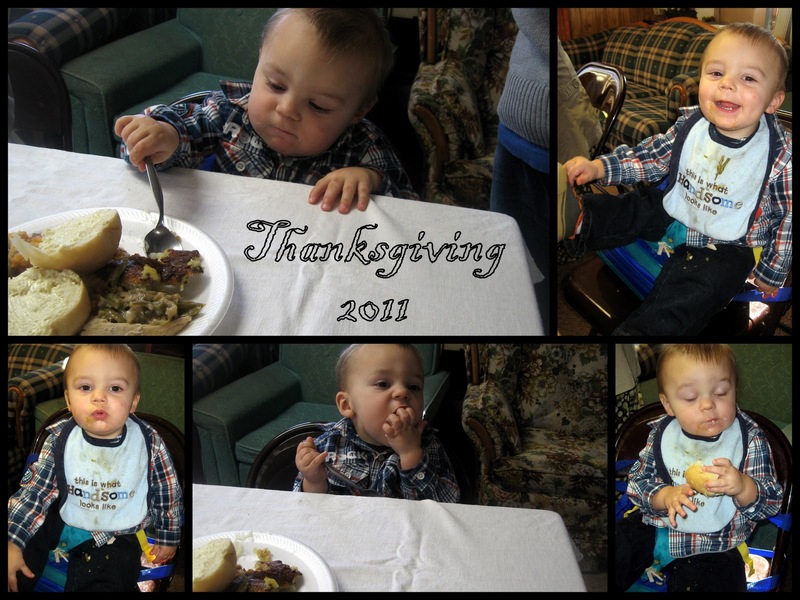 This year, I was excited to see Levi actually eat the once-a-year food, and he did not disappoint! My Aunt Janice hosts us all every year. She's got an open finished basement with plenty of room for 5 tables which each seat 10 people. It's an unspoken rule that going to this side of the family is a requirement - it's the only time we're all together. Well, actually, I guess it's not so unspoken. My grandma gave me a pretty good guilt trip about it a few years ago when we tried to visit Herb's family for a change. But I don't mind - there are other holidays to visit other parts of the family. After my aunts house, we headed to my dad's house. We couldn't stay too long because Mary had to go to bed at the same time as Levi. She is a manager at Sears and had to be at work by 2am for Black Friday! She read Levi a bed time story, and then we headed home. A little while after we got home, my dad showed up (oh the joys of only living thirty minutes apart now), and slept on our couch while Herb and I braved the crowds. Daily blogging this week. You're on a roll! OK, so this makes me miss my childhood. I have a GAGGLE of aunts and uncles and cousins, and we would often have HUGE get-togethers for Thanksgiving. It makes me sad that Evie doesn't have any cousins to play with around here (yet).